Luang Phor Yai, the principle Buddha in Kaew Far temple which is located at Tambon Bang Kanun, Amphoe Bang Kruai, Nonthaburi is red sand Buddha covered with plaster and gilded by gold which was built in Ayutthaya era, Luang Phor Yai is respectable among people in general communities in divinity particularly “lotteryplayers” who expect fortune coming to pay respect to Luang Phor Yai and taking a risk by shaking bamboo sticks and taking number of the fallen stick to take their risks and there is always rumors due to good luck person. 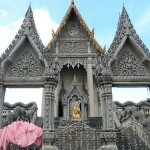 Due to Wat Kaew Far’s background, it was built approximately in B.E. 2095 in the reign of King Maha Chakrapat after the establishment of Nonthaburi town merely 3 years, the village where the temple is located formerly called Ban That and location of the temple is in plain area which always has flood in rainy season, the important historical sites in the temple are in the following: Phra Ubosot was built in B.E. 2114 with 5 rooms, it is the building which weighed by its walls with curved basement, there is front veranda, hugmklag wall, rove masonry, front door has two panels, the backside is covered and there is one opening behind principle Buddha. 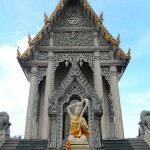 The temple had been renovated in the reign of King Rama II, the second king of Rattankosin era but the current condition is much deteriorated. Now it has been restored the lower walls surrounding Phra Ubosot are made of red sand decorated by pattern located on lion legs with two side howdah. 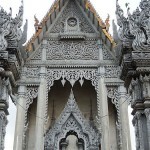 There two types of pagoda such as dodecagon square-based stupa with indented cornerslocated at 4 corners of the wall and a twenty square-based stupa with indented corner and lion based with lotus on top which is located behind Phra Ubosot outside the lower wall. 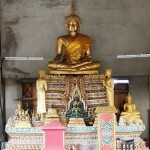 Phra Ubosot which was built since B.E. 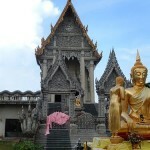 2114 is currently much deteriorated and the temple renovates it to be Wihan and building the new Ubosot in front of the old one. By boat, embark express boat at Tha Chang pier near Temple of the Emerald Buddha to Bangyai which can lead you toWat Kaew Far pier comfortably or embarking long-tailed boat or two-section boat from new Southern Bus Terminal pier or Wat Chalor pier which will lead you to Wat Kaew Far pier conveniently.